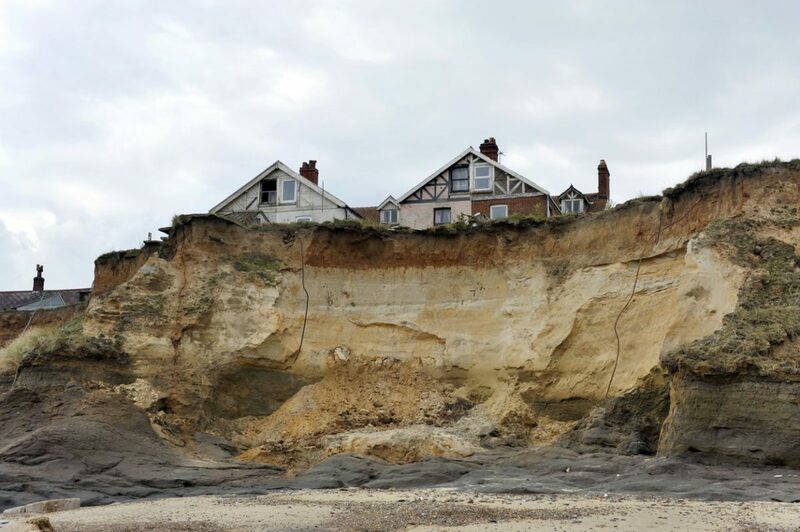 Coastal erosion is a process that causes the breaking down and removal of natural materials along a coastline, through storms, flooding, strong waves, and other environmental factors. These factors wear away at cliffs, bluffs and beaches, changing the landscape on a continuous basis. While coastal erosion itself has always been a natural way of shaping a coastline and forming beaches and other landforms, the process has exacerbated rapidly over time. In parts of the world where coastal areas are undeveloped, coastal erosion does not cause any major problems in the surrounding environment. However, the exact opposite can be said for areas in which a coastline is dotted with roads, buildings and other structures. In the U.S. alone, coastal erosion is responsible for approximately $500 million per year in coastal property loss, which includes damages to structures and loss of land. Federal and local government agencies as well as homeowners spend hundreds of millions of dollars each year to try and mitigate erosion, reinforce bluffs and restore sand to beaches. Many of these efforts are done in vain – geologists say that most of the U.S. ocean coastline is now eroding faster than ever. Coastal erosion rates vary greatly by region, and while some communities may be devastated by just a few feet of coastline erosion in one year, other regions may see as much as 25 feet of recession per year or more. With the force of nature working against them, coastal communities and homeowners are left to decide whether they will continue to spend their time and resources on fighting the effects of coastal erosion or make plans to move roads and structures further from the coastline. Even with risk reduction measures, some areas remain constantly in danger during severe storms, which have been predicted to increase in strength and frequency. In the Outer Banks of North Carolina, for example, residents are resistant to the idea of halting rebuilding efforts after Hurricane Florence. While the hurricane caused costly damage to much of the NC coasts, the idea of retreating is hard to swallow for the people who have invested in property and created their lives there. Coastal insurance agents certainly have reason to be concerned, as these environmental changes may impact the insurability of their clients in the future, but may not have much say in how these issues are handled. For now, many developers who are working on coastal rebuilding projects aren’t deterred by the rising insurance rates, as they largely pass these costs onto buyers, renters and tourists. And as long as consumers can afford these costs, it’s likely that homes and businesses won’t be retreating from their coastal locations until nature forces them to. Uncategorized Coastal Erosion, Coastal Insurance, Coastal Property, Coastal Property Insurance permalink.